Is it snowing in Bánkút ?¡Gracias! Mt Bükk is the second highest mountain in Hungary, with the second largest Hungarian city, Miskolc, lying directly at its base. Skiing has long traditions in North-Eastern Hungary, and the local people have contributed much effort and enthusiasm to the, nevertheless, moderate development of winter sports facilities. The no.1 ski resort here is Bankut, approximately 30 km west from Miskolc centre. The highest point of the resort rises 930 m above sea level and the largest difference in altitude covered by ski lift is about 200 m. This vertical drop can be spanned by advanced skiers on the racing course of 600 m length or it can be distributed over longer distances (max. 1300 m) of alternative courses taking less steep directions. The slopes are cut side by side in the forest of huge beech trees which lends the Hungarian name of the whole mountain. Mt. Bukk (Mount Bükk) belongs to the most strictly preserved area of the Bukk National Park. This special location, however, also means that capital investment for erecting high-scale resort hotels and a water supply for snow making can not be invited. The existing J-bar and cross-bar surface lifts, however can transport a maximum of about 3000 persons per hour to the top of the slopes. 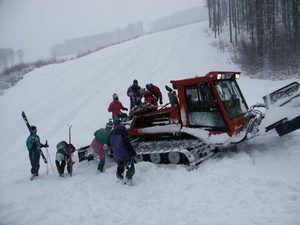 Snow making facilities can only provide for some repair purposes and the available piste machines regularly groom the relatively thin snow cover, of mostly natural origin, on the courses. The limited snow-making capacity is, however, supplemented by plastic sliding elements on the most popular slope to make up for the usually less abundant snow conditions. Weather related factors, therefore, are essential in determining the level of skiing one can get here. Accommodation is available in the house of the Bankut Ski Club, or in nearby hotels still at the top of Mt. Bukk. The micro-climate of the Bankut ski resort is favourable. There are northerly orientated slopes facing the rocky peaks of the High Tatras and the Slovakian mountains are seen from the top of the slopes in clear weather. The scenic vicinity of the higher ranges takes its toll on the expectable snow fall, at the ski area, unless there is a Mediterranean cyclone. Bankut is placed in the Bukk Mt (Bükk) and it has got good slopes with some good ski lifts. The slopes are not too long, but nice and wide. My favourite lift is the "C" lift, it's a Tatrapoma H130, it was destroyed in a big storm in Nov 2008 but the ski club rebuilded it and it can serve again. I think Bankut is a good ski park in profession. It has lighted up ski slopes, so we can ski at night in the Bukk (Bükk). I hope that in the future the ski club will buy some snow guns to improve the snow conditions.